emis.eucalyptus.com – More Mind Spew-age from Harold Spencer Jr.
CirrOS is a a trimmed-down OS that has been developed to run on cloud environments. When deployed on Eucalyptus clouds, CirrOS is very effective in confirming the clouds have been set up to provide instance networking, and instance services (metadata and userdata – similar to whats provided on AWS). Because its seen as being so helpful to cloud administrators, Eucalyptus added both 32 and 64 bit CirrOS images to eustore. This blog entry will cover how to use eustore to bundle, upload and register the CirrOS image, and how to use it to test out instance services on a Eucalyptus cloud. Victor Iglesias – Quality Engineer at Eucalyptus Systems, Inc – for introducing me to CirrOS. Scott Moser – Ubuntu Server Technical Lead at Canonical – for creating CirrOS, along with other great cloud tools like Cloud-Init. --hypervisor kvm -s "CirrOS 0.3.1 - x86_64"
Use euca-authorize to allow SSH traffic to the instance. After the instance has been launched successfully, lets look at some of the features of CirrOS that helps with troubleshooting instances. The authenticity of host 'euca-10-104-7-11.eucalyptus.euca-hasp.eucalyptus-systems.com (10.104.7.11)' can't be established. RSA key fingerprint is ae:3a:3f:4d:fe:a2:ab:a6:8d:0c:56:3f:18:93:d1:f9. Warning: Permanently added 'euca-10-104-7-11.eucalyptus.euca-hasp.eucalyptus-systems.com,10.104.7.11' (RSA) to the list of known hosts. Thats it! As demonstrated, CirrOS helps cloud administrators test networking and instance services for instances relatively quickly. Using CirrOS helps narrow down if there is a Eucalyptus cloud deployment issue versus an image issue. If you feel really adventurous, Scott has provided some great instructions on how cloud administrators can build their own CirrOS image by hand. Hope this helps. Enjoy! A few weeks ago, I posted a blog entitled “Fun with Varnish and Walrus on Eucalyptus, Part 1“. This blog will follow-up on my blog to showcase a few production use cases that utilize the Varnish–Walrus architecture built on top of Eucalyptus. *NOTE* This architecture can also be leveraged using AWS EC2 and S3. This is one of the many benefits of Eucalyptus being AWS compatible. Eustore uses the Varnish-Walrus architecture by pulling images through emi.eucalyptus.com (the varnish instance). The data for each of the images is stored in a JSON file located in a Walrus bukkit. For more information about Eustore, please refer to David Kavanagh’s Eustore blog. The Starter Eucalyptus Machine Images (EMIs) page uses the Varnish-Walrus architecture to allow users to download all of the EMIs that can be downloaded. Since emis.eucalyptus.com is a varnish instance, you can query logs there to get statistics on how many of each EMI has been downloaded. 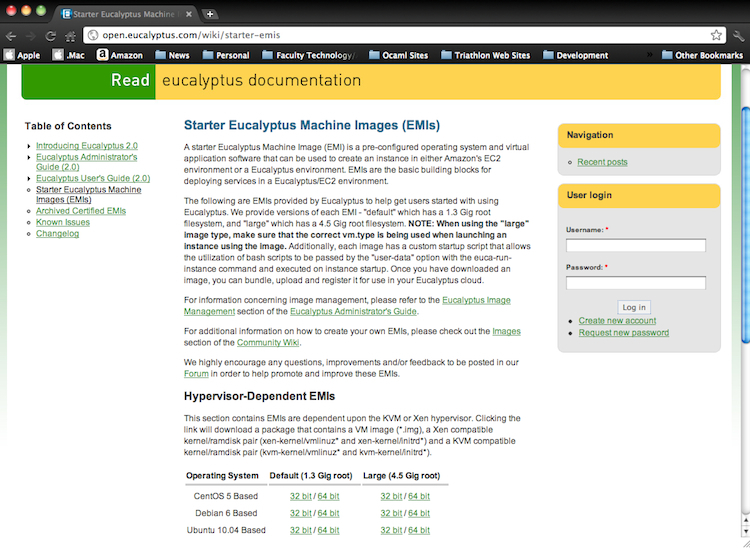 The Eucalyptus Machine Images page is a static web page for emis.eucalyptus.com, which is comprised of HTML, CSS, and jQuery – which are all stored in a Walrus bukkit. The web page for emis.eucalyptus.com definitely shows the power of using Walrus as a data store for various information. It accesses the same JSON file that is used by Eustore. We did this to make sure that there is consistency with all tools and web pages that provide access to the EMIs we create. Hope you enjoyed this introduction to the use cases we use here at Eucalyptus. Stay tuned to the follow-up blogs that provide a more in-depth view as to how each use case utilizes our Varnish-Walrus infrastructure. 1Eustore was designed by David Kavanagh, one of the many great colleagues I work with at Eucalyptus Systems. It initially started as a project idea that spurred from various image management needs discussed in the Eucalyptus Image Management group.